Located in the center of Biarritz, in the popular Les Halles district close to shops, bars and typical restaurants and its famous market. The apartment is so central that you will be spoiled for choice in terms of beaches: Côte Basque, Great beach, port-old, they are all 5 mins walk. Located on the second floor of a nice building, it has a nice view of typical houses in the region and on a street with a very appreciable calm of its location. The 50m2 apartment includes two rooms with a very modern decor. Downstairs, a large bright living room with a high ceiling, three windows, French doors opening onto a balcony with small sea view, equipped with a table and two chairs. The main room includes a dining area for four, sofa bed top new range 140 * 200 designed for daily sleeping, a 32 '' TV, Wifi, coffee tables, a design armchair, a large storage cupboard and toilets. The kitchen is open to the living room. Resolutely modern, it is fully equipped with fridge SMEG, dishwasher, washing machine, Kartell bar stools and furniture, microwave, Nespresso machine, dishwasher and cooking utensils. A spiral staircase industrial style leads to the large bedroom with a canopy to how "artist studio" very nice. It includes two cupboards, a bed 160 * 200 and its custom-made headboard and equipped with handy side cabinets, a desk, a modern bathroom with Italian shower and heated towel rail washer Laundry. You will enjoy an ideal location in Biarritz: The apartment is so central that you will be spoiled for choice in terms of beaches: Côte Basque, Great beach, port-old, they are all at 5 min walk. The Market Hall, all shops, bars and typical restaurants are just down the street. Bed linen and towels (one large and one small / pers): 30 Euros for 1 bed and 50 Euros for two beds with bed (s) made (s) on arrival. Modern bathroom with walk in shower, storage space and heated towel rail. Spent a week in this fabulous apartment and couldn't have been happier. The photos represent the space well. Though just steps from the liveliest part of Biarritz, the street and building are very quiet. I couldn't have chosen a better location had I tried. It was great to be within easy walking distance to excellent shopping, restaurants, Les Halles, and the water. Yet, it was also convenient to find we were close to a grocery store (just 2 blocks away), a coin-op laundromat (though there is an in-unit washing machine in the apartment), post office, etc. The apartment itself is quiet, well lit with natural light, and has many windows. The unit has everything you need and nothing you don't - perfect for such a stylish apartment. Details like quality bedding and a comfortable sofa were also very much appreciated. I wouldn't hesitate to recommend this rental to anyone and look forward to returning! We had a really good time at Francoise's apartment. 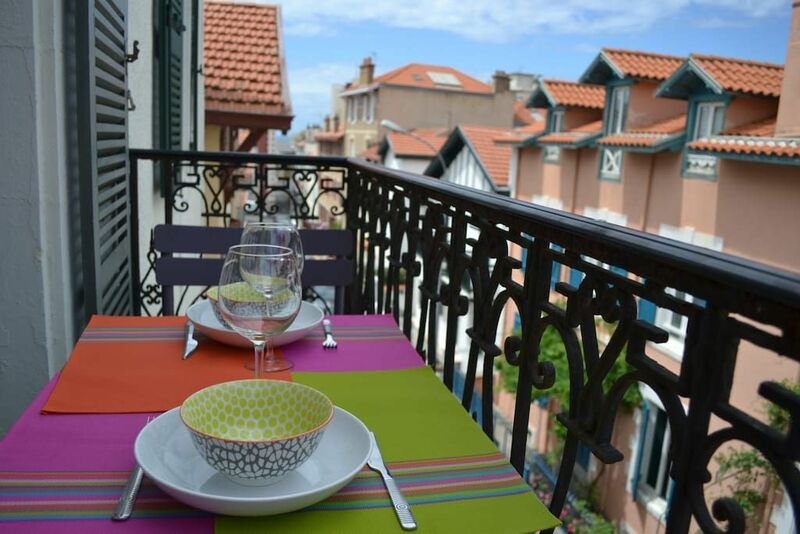 It's conveniently located in a nice and lively neighborhood of Biarritz. We found the apartment clean and exactly as shown on the images. Sometimes you can hear the neighbors, but apart from that it was very quiet and we could sleep well. Studio parfaitement situé au cœur de Biarritz. Très bonne adresse. Nous avons passé un excellent séjour dans cet appartement très fonctionnel et très bien aménagé. Situé juste à côté des halles et à mi-chemin entre la grande plage et le port vieux. Nous avons eu à la fois un très bon contact avec la propriétaire pour les préparatifs et un accueil irréprochable par Pauline qui a pris le relais sur place. Bref nous avons passé un très bon séjour et nous recommandons vivement cet appartement / hôte. Nous espérons pouvoir revenir rapidement. Merci mais à noter tout de même que c'est un deux pièces de 50 m2 et non un studio! Emplacement et équipement parfait. Nous étions à quelques minutes a pieds des halls, des retaurants, des transports et de la plage. Pour autant, l'appartement est très calme. Nous n'avons manqué de rien durant le séjour. A notre arrivée, tout était prêt pour nous accueillir et nous permettre de profiter pleinement des vacances. Un grand merci à Pauline pour son accueil chaleureux et ses bons conseils. Eine sehr geschmackvoll eingerichtete und weitgehend durchdachte Wohnung in zentraler Lage. Geschäfte, Restaurants, Cafés und Strände sind zu Fuß schnell erreichbar. Der kleine Balkon ist morgens und abends sonnig. Eine sehr gut ausgestattete Küche, in welcher sogar Kaffeekapseln vorhanden waren. Die Betreuung vor Ort durch Pauline war sehr freundlich, unkompliziert und flexibel. Die Vermieterin reagierte auf Rückragen sehr schnell. Nicht ganz dem Standard entsprachen die Warmwasserversorgung und insbesondere die Toilette. (Nur) wenn man sparsam duscht, können vier Personen nacheinander duschen. Die Toilette befindet sich getrennt von dem Bad in dem unteren Geschoss und verfügt über kein Handwaschbecken. Ist zwar in Frankreich häufiger so, aber eher nicht bei neu renovierten Wohnungen dieses Standards. Daher keine volle Punktzahl. Sonst wäre sie angebracht.